I’m sure you must have found yourself between one of those confusing moments when you just can’t decide on one option while you are looking to purchase a particular product or a service. It’s even more tricky over the Internet, so much so that you may order one thing and end up with something else altogether. All of the credit for this ongoing confusion goes to one thing; miles and miles long competition. I’m sure you wouldn’t be a stranger to online shopping and thus you must be aware of the how large variety of options these online services offer. A somewhat similar thing happens when you wish to get hosted by a reliable web host. There are tons of web hosting providers out there in the market, claiming that they are the boss. Plus, the concept of the more the merrier doesn’t apply while looking for a web host. You actually have to consider a lot of things before purchasing a hosting plan. You need to ensure that the concerned web host you like will serve all of those benefits which are essential and will play a big role in making your online business thrive. In this article, I’ll be reviewing YourLastHost, a proficient web hosting company which serves excellent quality services for all kinds of websites. YourLastHost is an Internet Service Provider (ISP) which excels in serving the best quality web hosting to all sizes of websites and businesses all over the world. Their enterprise-grade services are specially optimized for the open source solutions they grant to their clients. With years of experience down the road, YourLastHost has successfully tied contacts with one of the biggest names in the market. A web host should always maintain consistency, and the foremost priority at YourLastHost is to provide the maximum satisfaction to customers. There aren’t many hosts that claim their hosting services are going to provide maximum uptime response to their customers. But let me make you guys acquainted with one teeny-tiny secret; not every one of those providers is trust-worthy. A splendid web host can either do wonders or can be hazardous for your website. After all, your websites are way too important to be unavailable since they play a huge role in enhancing your online business presence. YourLastHost always ensures the topmost level of uptime guarantee and your website shall never face downtime at any time of the day. Let’s just downright admit it; we are no James Bond. You cannot grasp a complicated query and solve it within minutes. Unless you’re some kind of a proficient technical nerd, you’re obviously going to need assistance after getting your websites hosted. YourLastHost provides 24/7 expert support to every single one of their clients. I personally liked their support since I could reach out to the skilled team whenever I wanted. In addition to that, their support is effortlessly convenient to contact as well. YourLastHost’s very professional team will sort our any query the customer may ever have. YourLastHost offers the kind of secure environment that you will be hell-bent to find in any other host. Their security solutions and the premium anti-DDoS protection is something I found entirely praise-worthy. On top of that, the company guarantees to take protective measures on a daily basis so their customers can feel right at home and their peace of mind remains at its peak. The DDoS solutions are optional and uniquely customizable so that you can be able to operate it at your leisure whenever it suits you. I’ve only been using YourLastHost for a short period of time. However, I have come to like their performance and the stability that it serves. What made me YourLastHost’s admirer was the fact that they gave me time to trust their services on my own pace. I had a solid 90 days time frame, upon which I had to decide whether YourLastHost was worth a purchase for a long-run or not. If so, I could continue to host my websites with them, however, if that isn’t the case and a customer doesn’t like what they have to offer, then they can ask for their money to be returned within those first three months. 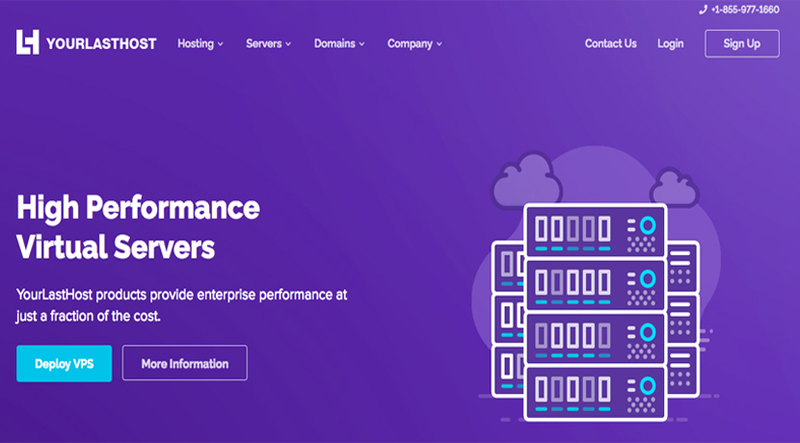 The reason behind YourLastHost’s mind-blowing performance and why it is highly recognized in the hosting market is because they only adopt the latest technology and optimize over a few of the grandest level of hardware known to man. More than 4000 servers have been deployed by YourLastHost with absolute 100% uptime. This achievement is a pretty big deal according to me and the fact that they are amazingly cheap and don’t run after their own profit makes them even more paramount. YourLastHost offers the most secure and powerful Web hosting packages, starting at just $1.99/mo. Truth be told, they are literally the most economical web hosting provider I’ve ever come across. YourLastHost’s Shared Hosting plans a wide array of features, massive SSD storage, and one-click installations. cPanel Shared Hosting is starting at just $2.99/mo. YourLastHost’s Dedicated Servers are really steadfast and powerful. The beginning prices of the Dedicated servers are starting at just $75.95/mo. YourLastHost’s Virtual Servers are starting at just $2.95/mo. YourLastHost’s Hybrid Servers are starting at just $49.95/mo. Servers not entirely capable for really large enterprises. Well over 1, 00,000 websites have been successfully hosted with YourLastHost and a few of those websites are mine. I am a happy customer and I am willingly suggesting all of my colleagues go for YourLastHost. One of the biggest eye-openers for anyone must be the cheap pricing packages. I mean, you need not over-spend your budget just for web hosting services. Second of all, they are not only secure, but YourLastHost’s services are also powerful, yet steady. Your chances of stumbling across a much cheaper, yet a premium web hosting provider in this lifetime are very low. So go get hosted with YourLastHost right now and send me your feedback on their hosting. One of the biggest eye-openers for anyone must be the cheap pricing packages. I mean, you need not over-spend your budget just for web hosting services.YourLastHost’s services are cheap and high performance. So go get hosted with YourLastHost right now and send me your feedback on their hosting.